When I opened my eyes yesterday morning, I said a prayer of thanks for the sweet little voices that roused me from sleep, for the kind and generous man whose best efforts to quiet those little voices came up short, and for every single one of my 37 years on this earth. It should be noted that the first thing I heard those sweet little voices say yell was, "I'M TELLING MOM ON YOU!" Finishing a cup of coffee, even though I had to reheat it six times. Taking a walk outside on the most glorious morning we've had in months. It's like Mother Nature knew I wanted fall-like weather and to see my breath for my birthday. 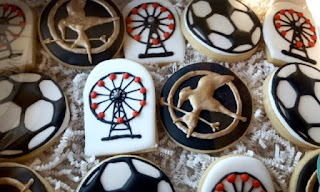 Eating lots and lots of Katniss cake. A few years ago, my sis-in-law photoshopped an Entertainment Weekly cover featuring Jennifer Lawrence as Katniss so it looked like I had taken over as star of The Hunger Games. For the last four years I've told Tom that all I wanted for my birthday was a Hunger Games cake, and this year, with a little help from our friends, he came through with this delicious and fabulous creation. Decorating our Christmas tree and putting out the rest of our Christmas decorations. I realize we haven't yet celebrated Thanksgiving, but I love returning from our Thanksgiving festivities to a home decked out in its Christmas finest. And finally, feeling the love from my family members and friends. From phone calls and texts to Facebook messages and emails to the sweetest, most thoughtful, most personal gifts, each and every one meant something to me. And because I talked them up last week, here are a few of the crazy awesome gifts my friends gave me...they clearly know me quite well! time to wear to the Mockingjay double feature. My soccer, Ferris Wheel, and Mockingjay cookies. My Chasing Roots Yeti mug. Wheel print (#10 out of the only 100 produced). This year's birthday one of the best, and for that I feel both happy and thankful.